Don’t know just how familiar y’all are with “The Gays”. But we, as a people, tend to like ……what we call,”Product”. We’re absolute suckers for creams, body washes, and lotions to keep us clean, smelling nice and looking youthful. Well, all those bottles and tubes have to go somewhere in the shower. Have you ever seen those bathrooms with absolutely NO storage in the shower and a dinky little wire basket suction-cupped to the wall? Don’t worry about us, folks. We’re adding a niche to the shower wall. Essentially, a big ol’ soap dish. 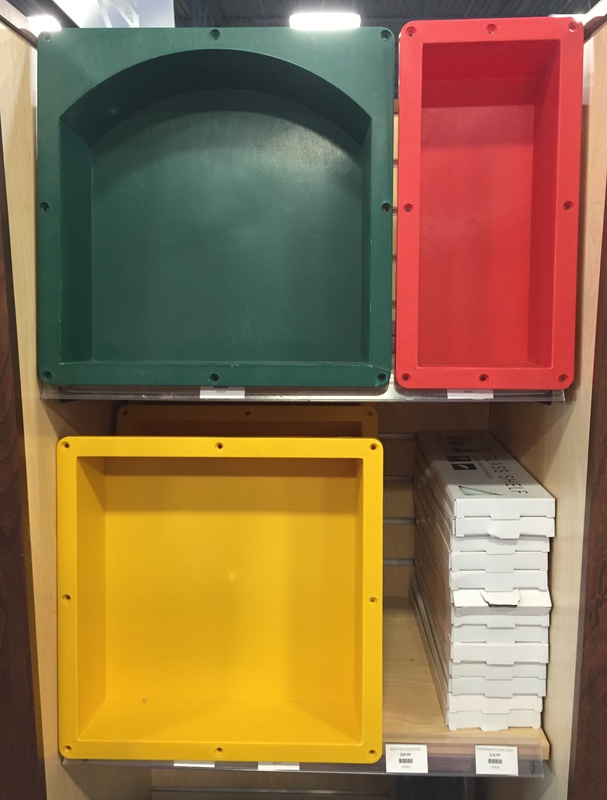 Our tile store offered a few ready-made plastic niches…in a odd-ball assortment of sizes…. If these work for y’all, great. They’re available online at the Tile Shop. 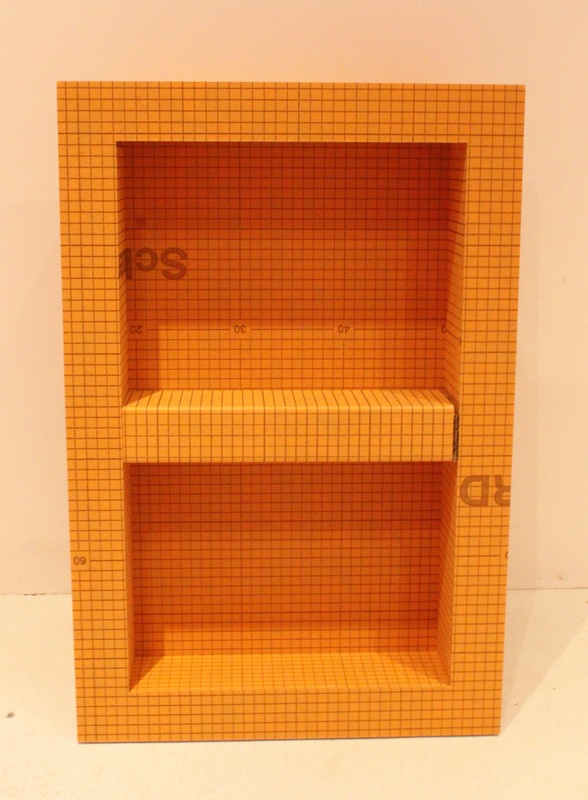 This one looked promising for us, but it’s 14″ X 14″….. 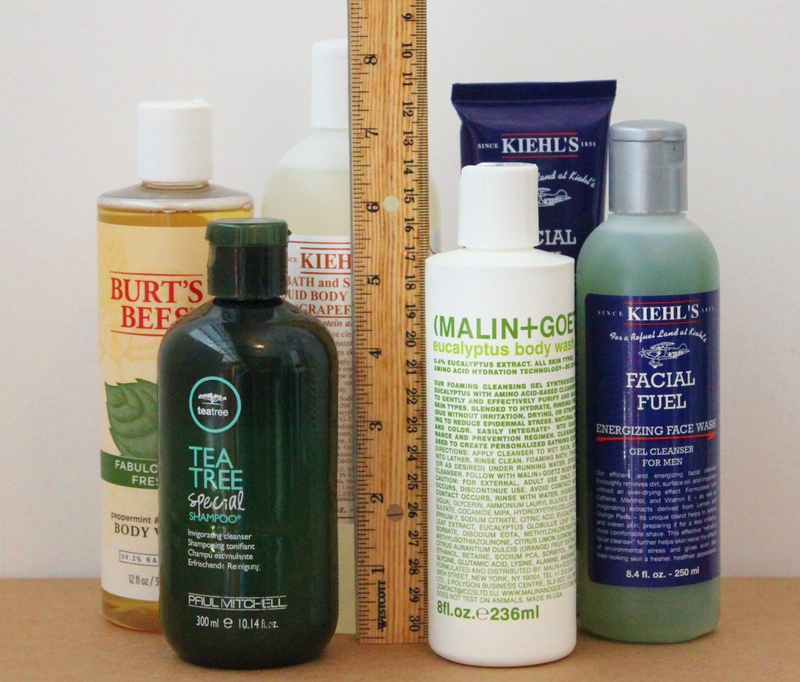 I grabbed a few of the biggest bottles of “product” we use, and the tallest one is just a little over 8 inches tall. 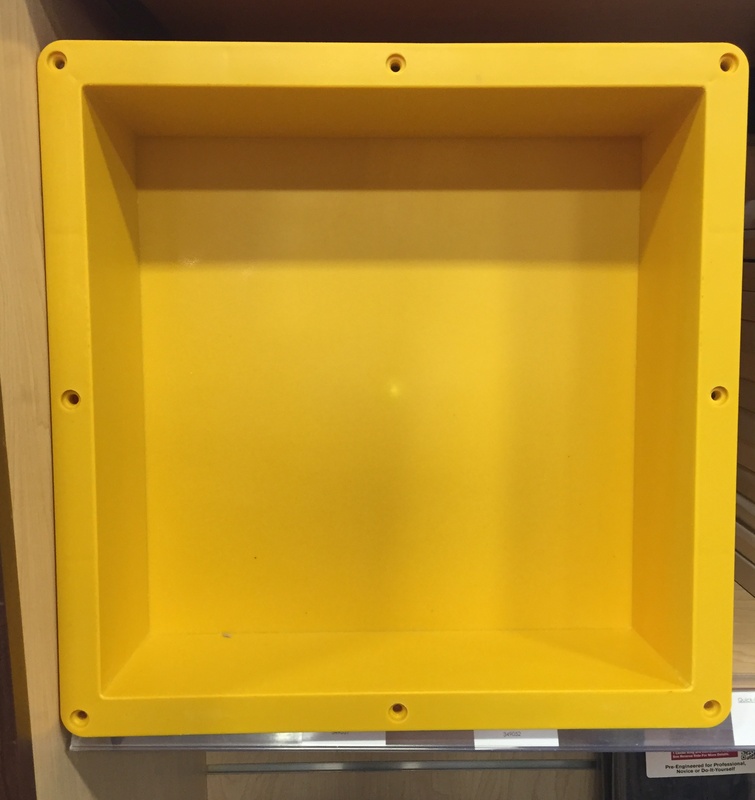 That’s barely over half the height of the yellow plastic niche. Lot of wasted space in that one. Then Jamie found this thing on the Lowe’s website. Kedri Board Shower Niche. Made of a lightweight Kedri Board foam….and with an adjustable middle shelf. It was special order only….and it wasn’t cheap. No surprise there. just add another 100 bucks to this project. But at 12″ X 20″, it’s just the right amount of storage that we need. So we bit the $100 bullet and ordered one. The wall that the shower head used to set on is the perfect place for this. It’s not all all focal when you enter the room. 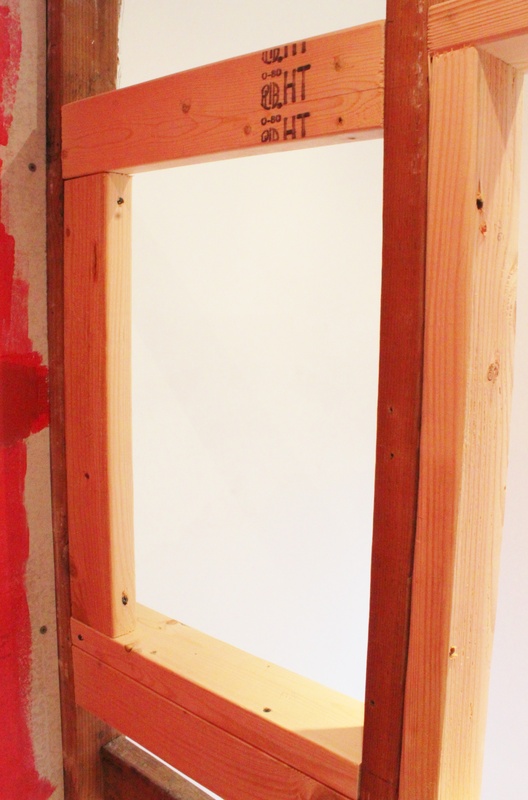 So I framed out the opening in the exposed wall with 2X4’s to fit the niche. 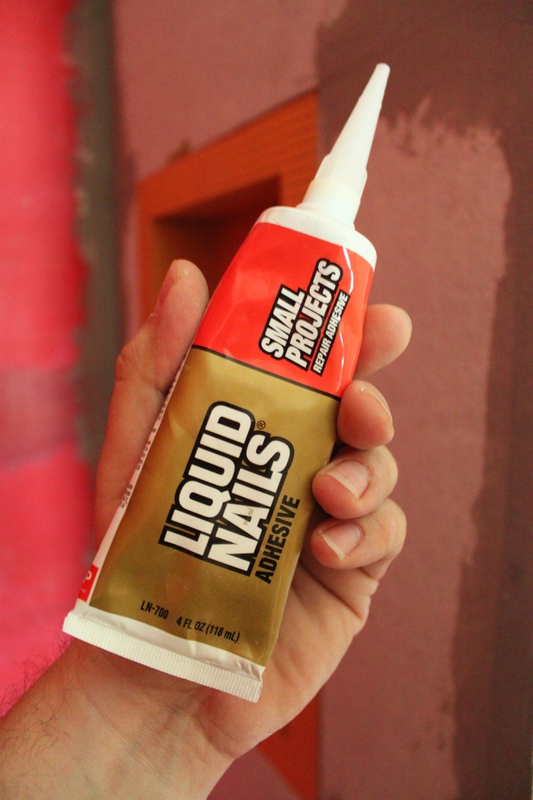 Instead of screwing it in place, and poking holes in it, I glued it down with Liquid Nails for Small Projects. Just added a bead all along the edge of my frame. 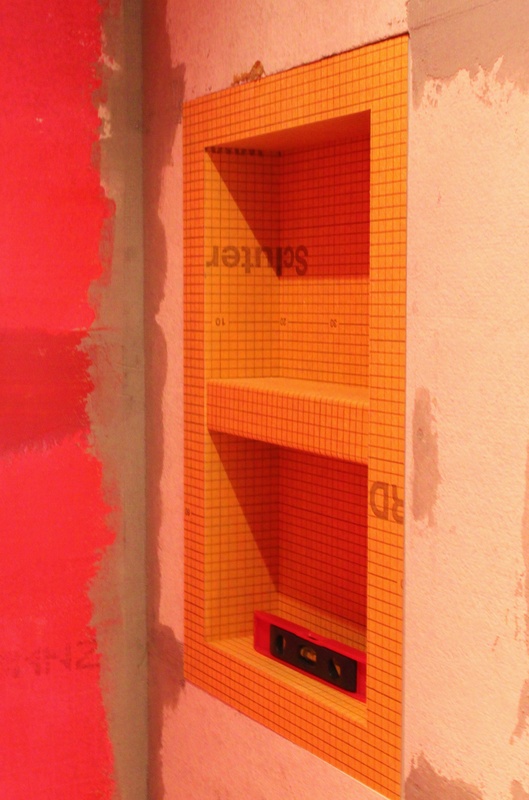 Then fit the niche in place….with a level of course…..nestled in the Hardi Board wall of the shower. 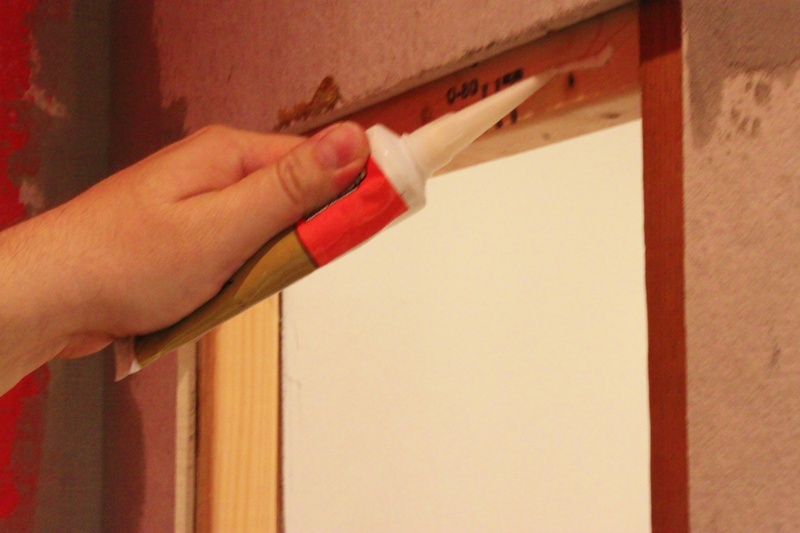 Like the Hardi Board, I also had to cover the seams of the niche to prevent moisture leakage. 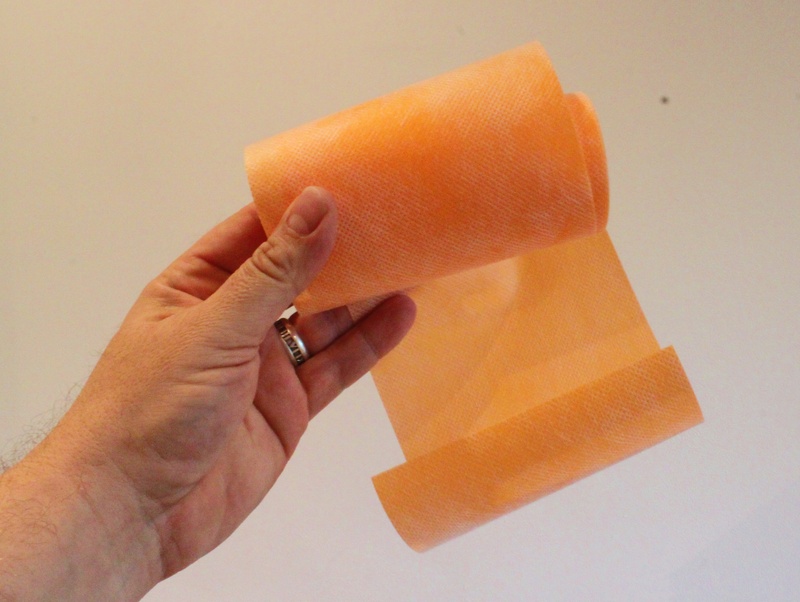 The Kerdi company recommends using their own product, a Kerdi Waterproof Liner, to cover the entire wall. No big surprise. The surprise was the price. A 3′ X 16′ roll was 100 bucks. Of course it was. Everything is 100 bucks. OOOhhh, did I mention that it was also special order only? No kidding. But Jamie found this 5 inch roll of waterproof liner at the tile shop. Only 9 bucks? Sold! 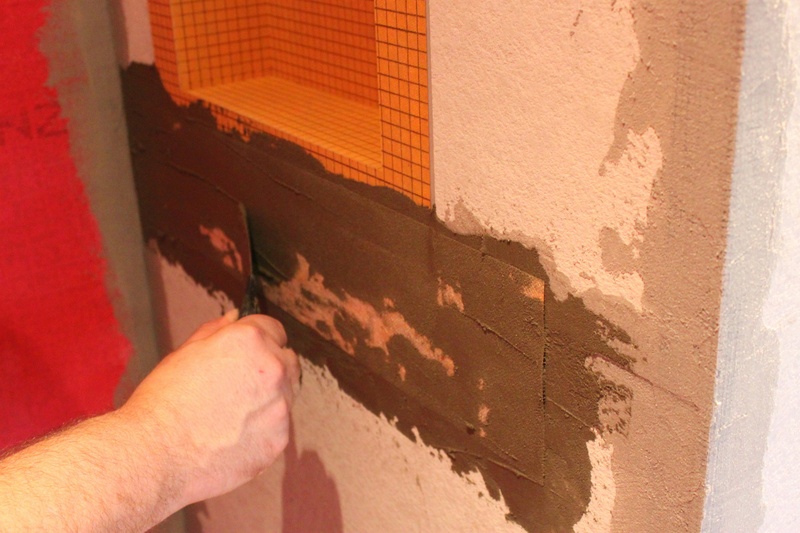 We just had to apply it with a thin layer of Mortar. 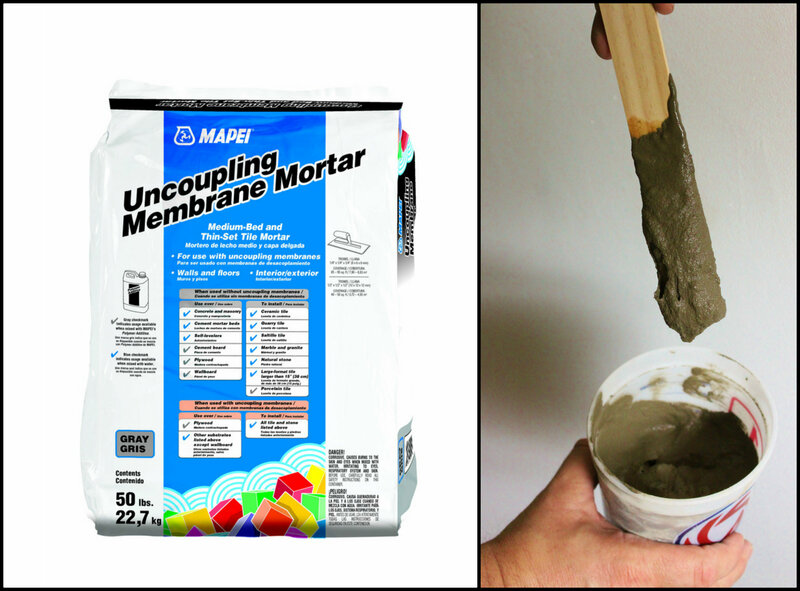 Uncoupling Membrane Mortar to be exact. This stuff was only 13 bucks, WooHoo. BUT we had to buy 50 pounds of it. It mixes with water to a “frosting-like” consistency…. …. I spread it over the seams, add a layer of nylon waterproofing liner, and another layer of mortar. 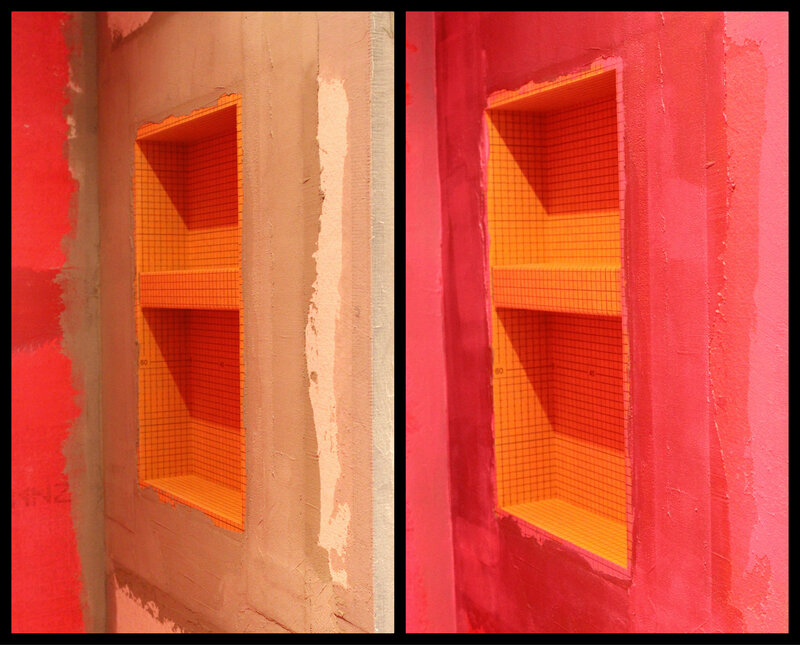 Did a piece on all 4 sides……followed by, of course, a layer of the Red Guard Waterproofing……….just to be safe. Pretty sure we are completely water tight. AND have place to store all our shower crap. Oh well…..what’s a hundred bucks in the grand scheme of things!!! Love the way the master bath is shaping up. Thanks Chris…we’re certainly taking our Sweet time with it…a professional is coming in next week to tackle an issue we’ve hit…..after that, we’re ready for tile. Now with such a classy shelving system, you are going to have to keep your product bottles looking organized. You may even have to start looking for matching colors. 🙂 This is going to be quite the spa when you are done. You have no idea Judy……We’re both so excited…and ready to start the other bathroom. I have been waiting to see the latest installment. I’m slow to post the progress Carole……but it’s happening, I promise.Should be doing tile in about a week….. Looking good ! Can’t wait to see the tile! Take care! Looking forward to the next post. Thanks Kim, we’re getting there. I said we weren’t in any hurry. Tile selection is coming up soon ….. Awesome! she exclaims, as her bathrooms are sadly sans niches. I love the word “product”, but truthfully, we’re kind of lacking in that department, too. Interesting to follow your project! Ha, I cackled so hard at the opening of this post! But yes, what IS it with storage-less showers? It’s as if we’re supposed to just rinse with water. Where’s the fun in that?! We were looking at a bathroom remodel on another site for inspiration, and it was totally lacking shower storage. WTH? We were originally going to make a ledge across the back wall, but it shrunk the already tight shower size…..so Big soap dish it is….. I love the updates on your shower. I cannot wait to see the finished product. A nice variety of products in the shower is mandatory.